Life With 4 Boys: Wouldn't This Be Nice? - Bounce Houses Now! Wouldn't This Be Nice? 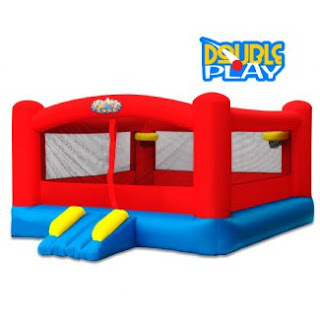 - Bounce Houses Now! My boys already bounce off the walls all the time anyway, so I might as well give them something safe to bounce in right? I mean, how totally and unbelievably cool of a mom would I be if I can home with this? That my friends is no ordinary bouncy house, that is the grand mack daddy of all bounce houses, the Double Play Moon Walk by Blast Zone. We are talking commercial quality, basketball hoops, the works! Hear that? That is the sound of peace and quite as my kids don't constantly whine that they are bored and have nothing to do. * I created this post in an effort to have a chance to win a bounce house from BounceHousesNow.com. I was not compensated for this post in any way and all words, thoughts and opinions expressed here are entirely my own. Good Luck! What a great way for your boys to burn off their energy! And I have a feeling that if it doesn't quite fit in your yard, you will make it fit. Thanks so much for the well wishes, but I didn't win the bounce house. I did win an awesome $350 Kenmore vacuum that I actually really needed!